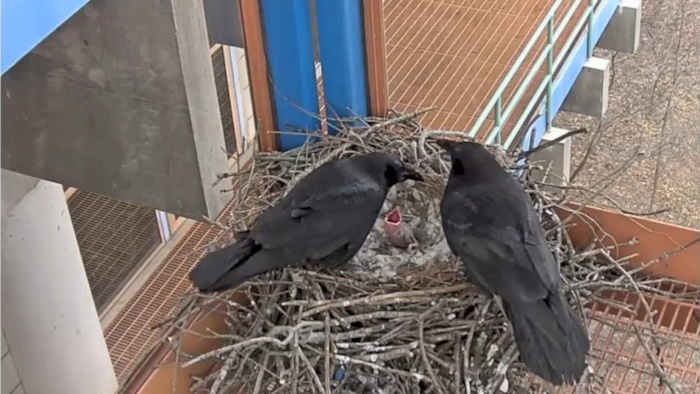 Frost Professor of Environmental Science and Professor of Biological Sciences Nicholas Rodenhouse had occasion in 2014 to record and live stream a unique ornithological event on campus — a pair of wild ravens nesting on the fire escape of the Science Center. The Director of Emering Technologies suggested purchasing an outdoor-ready 1080p network camera, which could provide high image quality even in low light conditions. He also suggested using a cloud service to allow a live web broadcast of the ravens’ activity, as well as to record it to .mp4 video files for further study. Together, they helped Wellesley College Communications & Public Affairs publish a special website for the project. The site received 10,0000 views in the first three days and went on to broadcast the ravens 24 hours a day for two months, including the hatching of one chick. They later ‘chunked’ the recordings into 3-hour segments for efficient review and analysis by Professor Rodenhouse's student assistant in the summer of 2014. The ravens returned to campus in 2015 and 2016.